At this year’s anniversary ITS our group presents seven accepted contributions – 2 full papers, 2 posters, 2 workshop contributions, 1 doctoral symposium submission. 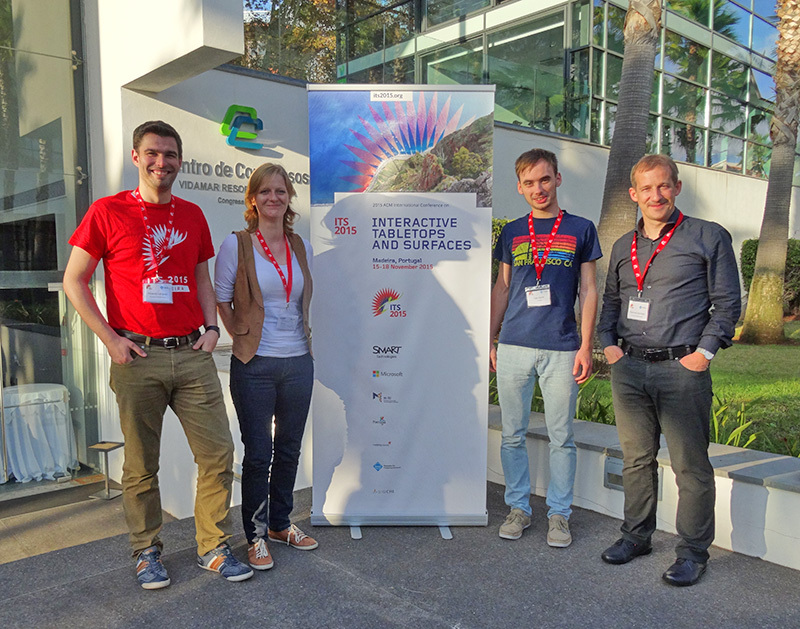 The 2015 ACM International Conference on Interactive Tabletops and Surfaces takes place in Funchal, Madeira from November 15th to 18th, 2015. The subject of our full paper “BodyLenses – Embodied Magic Lenses and Personal Territories for Wall Displays” are personal body-controlled magic lenses at large vertical displays. Additionally, Fabrice Matulic will present the full paper “Eyes-Free Touch Command Support for Pen-Based Digital Whiteboards via Handheld Devices” which is joint work with ETH Zürich. On Wednesday, July 8th, Professor Marc Erich Latoschik of the Chair of Human-Computer Interaction at the Julius-Maximilians-University of Würzburg will give a talk in the Dresden Talks on Interaction & Visualization. The talk with the title Intelligent, Interactive, Multimodal – Techniques for Future Human-Computer Interfaces takes place in room APB 1004, starting at 1.15 pm. We look forward to this exciting research talk. Konstantin Klamka received an award for his project presented at OUTPUT 2015. 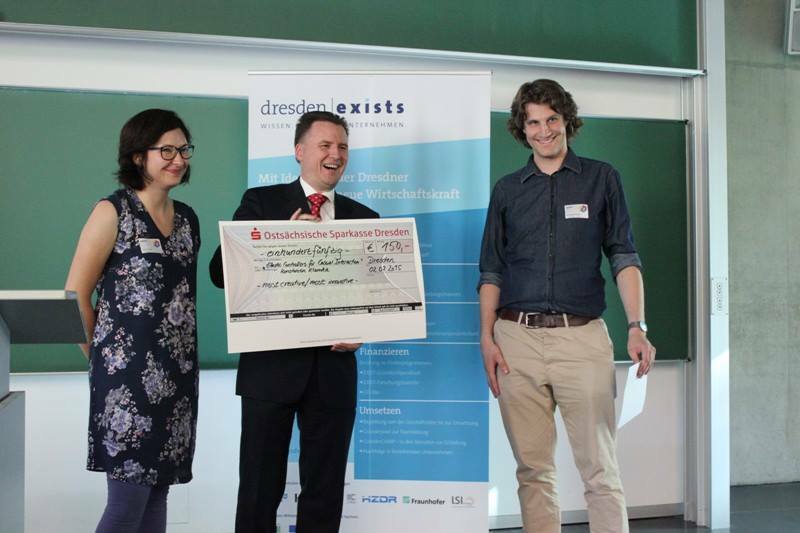 Under the title “be creative – be innovative” dresden|exist, a group supporting founding of companies from TU Dresden, awarded Konstantin’s project Elasticcon as one of the most creative and innovative demos. Elasticcon is an elastic controller that allows remote-controlling of a computer using a retractable string and exchangeable traction knobs. Engaging demos at the Interactive Media Lab Dresden again aroused a great deal of interest at this year’s OUTPUT and Long Night of Sciences. Many guests, students and faculty members came together on Friday, June 5th, to celebrate the 20th anniversary of the Chair of Multimedia-Technology at the Faculty of Computer Science. The celebrations were initiated by Prof. Meißner (Chair MMT) discussing the importance and challenges of multimedia technology in our current world. Afterwards, Prof. Dachselt (Chair MT) talked about the work of the Interactive Media Lab and the important connection of media and human-computer interacton. 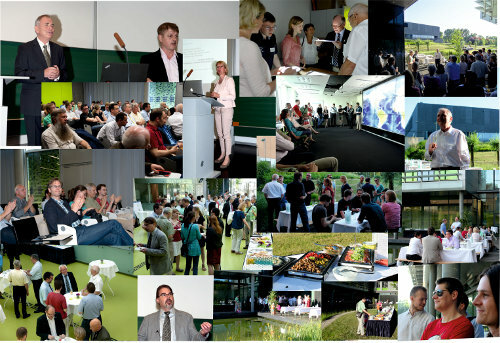 Then followed three interesting research talks by invited speakers Prof. Dr. Frank Schönefeld (T-Systems Multimedia Solutions GmbH), Prof. Dr.-Ing. Andreas Nürnberger (Otto-von-Guericke-Universität Magdeburg) und Prof. Dr. Susanne Boll (Carl von Ossietzky Universität Oldenburg). Finger food in the lounge allowed for discussions of the topic. Am Freitag, dem 5. 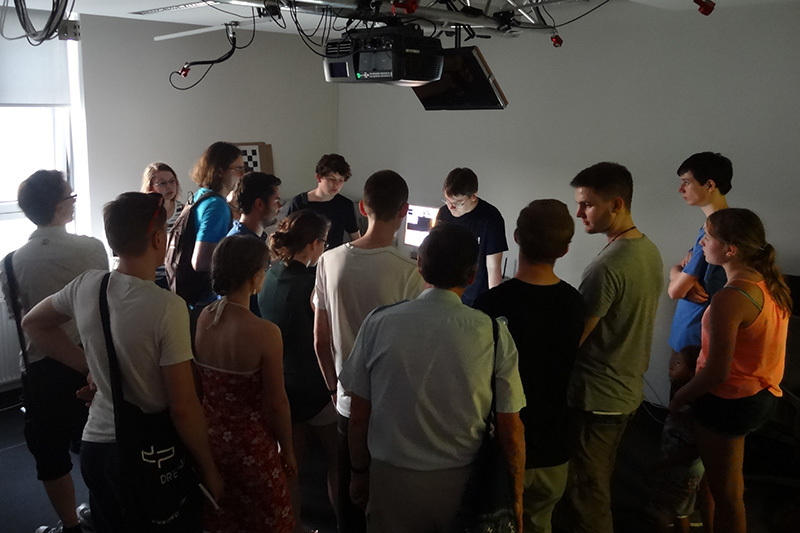 Juni, findet zum Thema 20 Jahre Multimediatechnik an der Fakultät Informatik eine gemeinsame Festveranstaltung der Professur MMT und des Interactive Media Lab Dresden statt. Unter dem Titel “Perspektiven Multimedialer Technologien” wird ab 14:00 Uhr in einem Vortragsprogramm über vergangene Herausforderungen und zukünftige Perspektiven reflektiert. In diesem Rahmen freuen wir uns, drei spannende Gastvorträge ankündigen zu dürfen. Prof. Dr. Frank Schönefeld von der T-Systems Multimedia Solutions GmbH wird ab ca. 14:35 Uhr zum Thema “Digitale Disruption durch multimediale Technologien - Industrielle Herausforderungen und Chancen“ referieren. Gegen 15:45 Uhr begrüßen wir Prof. Dr.-Ing. Andreas Nürnberger von der Otto-von-Guericke-Universität Magdeburg zu seinem Vortrag “Exploring and Organizing Multimedia Collections: Meta-Data and Adaptivity“. Schließlich wird Frau Prof. Dr. Susanne Boll von der Carl von Ossietzky Universität Oldenburg um 16:30 einen Vortrag zum Thema “Multimedia trifft Mensch-Technik Interaktion“ halten. 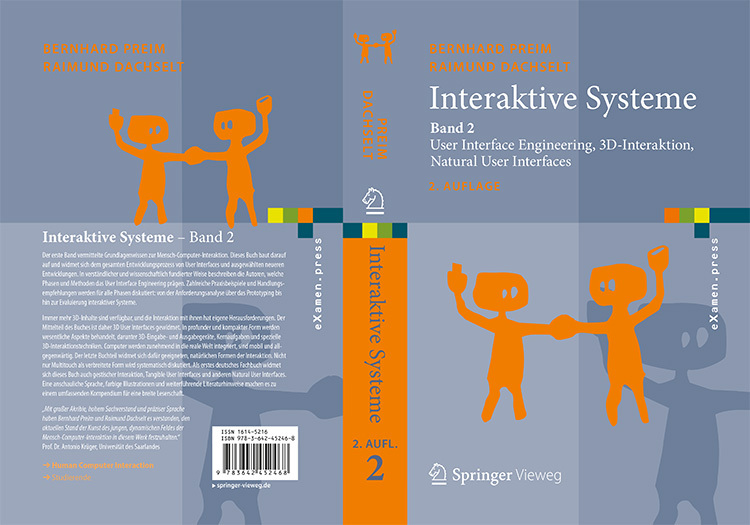 User Interface Engineering (the entire development process of User Interfaces), 3D User Interfaces (incl. input/output devices, basic and advanced 3D interaction) und Natural User Interfaces (gestural interaction, interactive surfaces, Tangible UIs). In combination with volume 1, the comprehensive 1,400 page compendium now covers a wide range of HCI topics for a broad audience. The book can be ordered in print, as an eBook, or downloaded as a PDF at Springer Link. The accompanying book website contains more information, and a table of contents can be downloaded here (sorry, only in German, like the entire book ;-). On Friday, January 23rd, Professor Gerik Scheuermann of the Image and Signal Processing Group (Abteilung Bild- und Signalverarbeitung) at the University of Leipzig will start this year’s season of the Dresden Talks on Interaction & Visualization. The talk about Topological and Feature Oriented Visualization of Simulations from Continuum Mechanics takes place in room APB E023, starting at 1 pm. We look forward to this exciting research talk.